When Babe Ruth said:” Baseball was, is and always will be to me the best game in the world” he spoke on behalf of the US nation. Saying that Americans love baseball, is a huge understatement. If you have ever been to a capacity-filled Dodger or Yankee Stadium you will agree that the atmosphere is second to none. Even the 159 minor league teams garner so much attention that game day is a positively festive affair with food trucks, giveaways and between-innings entertainment for the whole family. At many of these games, you will also come across some high-skilled entertainers of the canine variety who are fast becoming even more beloved than some of the nation’s best players. Two of these dogs, Chase and ‘Jake the Diamond’ has crept deep into the hearts of American baseball fans. Deuce, the golden retriever with the wagging tail, is the fourth dog specifically trained to entertain the crowds at minor league baseball games. Collectively known as ‘Jake the Diamond Dog’, the amusing canines have been a real crowd pleaser since as far back as 1990 when Jericho the first ‘diamond dog’ starting bring water to the umpires. After Jericho died, two more dogs took over the role with Deuce finally taking over the mantle in 2009. 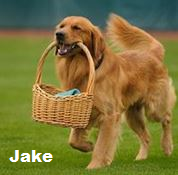 Jake is a familiar sight at minor league baseball games where he delivers the ball to the pitcher, shags foul balls, plays batboy and catches Frisbees, much to the delight of the fans. When Jake isn’t performing, he stays in an inflatable dog house on the first-base line, where he is safe from line drives. Jeff Marchal, who owns and trains ‘Jake’ says that there is such a huge demand for the diamond dog that he is considering training another dog soon. This will enable more of America to make the acquaintance of one of the most popular baseballs dogs of all time. Jake isn’t just a hit on the baseball field, he is also quite the social media whiz and has more than 3000 ‘Likes’ on his Facebook page. Another golden retriever, this one named Chase, entertained the fans of New York Yankees affiliate Trenton Thunder since as far back as 2002. Chase was the original team bat dog, regularly seen trotting out to the batter’s box to pick up bats with his mouth, bringing them back to the dugout. He was also known to carry a basket of water bottles to the umpires and entertained his countless fans even more by running down flying discs in the outfield. During his time with Trenton, Thunder Chase received worldwide recognition thanks to CNN and Japanese television and also appeared nationally on ESPN, FOX and the YES Network. Sadly, Chase died of lymphoma in 2013 but not before he became one of the most beloved faces in US baseball. Chased survived just long enough to be thrown a rather distinguished retirement party by the Trenton Thunder team. There is a reason why dogs have been known as man’s best friend since the beginning of time. Not only do they protect us and provide companionship, but they also bring an added dimension of entertainment to some of America’s most well-loved sports. Without the likes of Jake the Diamond and Chase, baseball would, despite being immensely popular, not have the same family appeal it has today. 2018 MSBL Las Vegas Open Champions Crowned!